a chemical element, atomic number 26, atomic weight 55.847. (See Appendix 6-1.) Iron is chiefly important to the human body because it is the main constituent of hemoglobin, cytochrome, and other components of respiratory enzyme systems. A constant although small intake of iron in food is needed to replace erythrocytes that are destroyed in the body processes. Most iron reaches the body in food, where it occurs naturally in the form of iron compounds. These are converted for use in the body by the action of the hydrochloric acid produced in the stomach. This acid separates the iron from the food and combines with it in a form that is readily assimilable by the body. Vitamin C enhances absorption of iron, and alkalis hamper absorption. Iron Deficiencies. The amount of new iron needed every day by the adult body is about 18 mg. A child needs more in proportion to weight. Although these amounts are very small, iron deficiencies may cause serious disorders. Three stages of iron deficiency are distinguished: iron depletion or prelatent iron deficiency, in which bodily stores are mildly depleted but no change in hematocrit or serum iron levels is detectable; latent iron deficiency, in which the serum iron level has dropped but the hematocrit is unchanged and there is no anemia; and iron deficiency anemia, a serious condition characterized by low to absent iron stores, low hematocrit, and other blood abnormalities. A great loss of blood, such as may result from bleeding ulcers, hemorrhoids, or injury, is the most common cause of a deficiency of iron. Women who lose much blood in menstruation may have to supplement their diet with iron-rich food. Iron deficiency sometimes occurs in pregnancy as a result of increased demands on the mother's blood. It may also occur in infants, since milk contains little iron. Although babies are born with an extra supply of hemoglobin, by the age of 2 or 3 months they need iron-rich food to supplement milk. Iron preparations, such as ferrous sulfate, may be necessary in the treatment of iron deficiency anemia; they should be administered after meals, never on an empty stomach. The patient should be warned that the drugs cause stools to turn dark green or black. Overdosage may cause severe systemic reactions. An acute iron deficiency may warrant parenteral administration of an iron supplement. Hypersensitivity to iron supplements often occurs in patients with other known allergies. In other patients the parenteral administration of iron can cause vomiting, chills, fever, headache, joint pain, and urticaria. Food Sources of Iron. Liver is the richest source of iron; 200 g (6 ounces) of liver contains a whole day's supply for an adult. Other iron-rich foods include lean meat, oysters, kidney beans, whole wheat bread, kale, spinach, egg yolk, turnip greens, beet greens, carrots, apricots, and raisins. Iron metabolism. Uptake of heme iron or ferrous iron occurs in the intestine. From the intestine, iron is transported on transferrin to the liver or the bone marrow. Transferrin binds to red blood precursors in the bone marrow and delivers iron for incorporation into hemoglobin. Red blood cells in the circulation contain 60 percent to 80 percent of body iron. Old red blood cels are destroyed in the spleen. The iron is bound to transferrin for recirculation. Approximately 20 percent to 30 percent of iron is stored in the form of hemosiderin in the spleen, liver, and bone marrow. The remaining iron is in the respiratory enzymes of somatic cells. Iron is lost by desquamation of skin and intestinal cells. From Damjanov, 2000.
iron 59 a radioisotope of iron having a half-life of 44.5 days; used in ferrokinetics tests to determine the rate at which iron is cleared from the plasma and incorporated in red blood cells. Symbol 59Fe. iron dextran a complex of iron and dextran of low molecular weight; administered intravenously or intramuscularly as a hematinic. iron poisoning poisoning from ingestion of excessive iron or iron-containing compounds, such as in children who eat iron supplement tablets like candy; symptoms include ulceration of the gastrointestinal tract, vomiting, vasodilation with shock, metabolic acidosis, liver injury, and coagulation disturbances. iron sucrose a complex of ferric hydroxide, Fe(OH)3, in sucrose; used intravenously to treat iron deficiency anemia in hemodialysis patients receiving supplemental erythropoietin therapy. • Parenteral use has caused anaphylactictype reactions, some resulting in death. Use only in patients with clearly established indications when laboratory tests confirm iron deficiency not amenable to oral iron therapy. Give drug only where resuscitation techniques and treatment of anaphylactic and anaphylactoid shock are readily available. Give test dose before starting I.V. or I.M. therapy: For I.V. use, administer test dose of 0.5 ml (25 mg) I.V. over 30 seconds to 5 minutes; if no reactions occur within 1 hour, give remainder of therapeutic dose I.V. ; repeat this dose daily. For I.M. use, give test dose of 0.5 ml (25 mg) by Z-track method; if no reactions occur, give daily doses not exceeding 100 mg I.M. in adults, 50 mg I.M. in children weighing more than 10 kg (22 lb), or 25 mg in infants weighing less than 5 kg (11 lb). • For I.M. administration, inject by Z-track method into upper outer quadrant of gluteal muscle. • For intermittent I.V. infusion, administer undiluted at a rate no faster than 1 ml/minute. • Don't give with oral iron preparations. ☞ Monitor for hypersensitivity reaction. Keep epinephrine and other emergency supplies on hand in case reaction occurs. • Assess serum ferritin levels regularly, because these levels correlate with iron stores. • In patients with rheumatoid arthritis, monitor for acute exacerbation of joint pain and swelling. Provide appropriate comfort measures. • Watch for signs and symptoms of iron overload, including decreased activity, sedation, and GI or respiratory tract bleeding. • Caution patient not to take oral iron preparations or vitamins containing iron during therapy. • Instruct patient to report difficulty breathing, itching, or rash. • Tell patient he'll undergo periodic blood testing to monitor his response to therapy. • As appropriate, review all other significant and life-threatening adverse reactions mentioned above. indication It is prescribed in the treatment of iron deficiency anemia that is not responsive to oral iron therapy. contraindications Early pregnancy, anemias other than iron deficiency anemia, or known hypersensitivity to this drug prohibits its use. adverse effects Among the more serious adverse effects are severe hypersensitivity reactions, including fatal anaphylaxis. Inflammation or phlebitis at the site of injection, arthralgia, headache, GI distress, fever, and lesser hypersensitivity reactions may occur. An iron hydroxide dextran complex given by injection to treat iron deficiency anaemia in adults who have shown intolerance to oral iron preparations. The drug is on the WHO official list. a chemical element, atomic number 26, atomic weight 55.847, symbol Fe. See Table 6. Iron is chiefly important to the animal body because it is the main constituent of hemoglobin, cytochrome, and other components of respiratory enzyme systems. A constant although small intake of iron in food is needed to replace erythrocytes that are destroyed in the body processes. a radioisotope of iron having a half-life of 45 days; used in ferrokinetics tests to determine the rate at which iron is cleared from the plasma and incorporated in red cells. Symbol 59Fe. absorbed iron is rapidly and tightly bound to a specific transport protein, transferrin or siderophilin, from which it is discharged at iron receptor sites in the bone marrow. an injectable form of iron used in the prevention of iron deficiency. See iron poisoning (below). used as an injection vehicle for iron in young piglets. is most common in piglets raised on sows kept indoors under artificial conditions. Clinical signs are pallor, dyspnea, edema of the head and a secondary diarrhea. 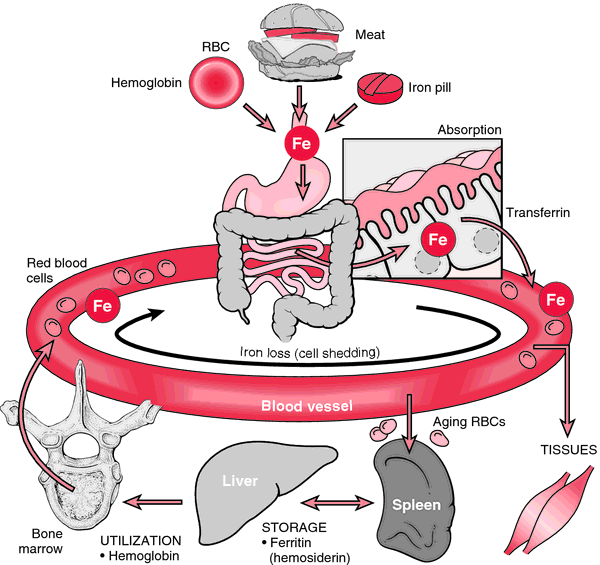 storage of excessive iron in body tissues such as occurs in human idiopathic hemochromatosis is not recorded in animals, but overload may occur as a result of excessive therapy. overdosing piglets with iron compounds by mouth causes diarrhea and death. Organic iron preparations, usually dextrans, injected in piglets can cause deaths acutely, within an hour or two of injection. At postmortem examination there is myonecrosis of skeletal muscle. Deaths have also occurred within a few minutes of intramuscular injection of organic iron preparations in horses. Sudden death due to massive liver damage also recorded in newborn foals dosed orally with ferrous fumarate with or without yeast in a paste. Asymmetry of the hindquarters in pigs is also recorded as a sequel of intramuscular injections of iron. See also asymmetric hind quarter syndrome. Bore water often contains significant levels of iron and when used for fish culture in dams may cause mortalities. a source of readily available iron for metabolic emergencies, probably located in the bone marrow. polypeptides that contain iron-sulfur centers capable of Fe2S2 or Fe4S4 stoichiometry and with standard reduction potential between NAD+ and ubiquinone. Critical components of many electron transport chains, e.g. in oxidative phosphorylation and photosynthesis. the serum iron plus the unbound iron-binding capacity of the serum. that portion of the plasma transferrin molecule that is not bound to Fe3+. highly hepatoxic in some newborn foals when fed as a dietary supplement. There is considerable controversy about the relative safety profiles of the various preparations, especially the iron dextrans. Iron deficiency: what are the future trends in diagnostics and therapeutics? 5 g/dl lower than the mean haemoglobin levels reported in an earlier study after an injection of 1000 mg of iron dextran complex (22). Injection Ranitidine (Aciloc (b) 2 ml) @ 1 ml twice daily IM for 3 days, injection Iron dextran (Imferon (c)) @ 2 ml IM single dose, injection B-Complex (Conciplex (d)) @ 2 ml once daily IM for 3 days, syrup Haem-up (b) @ 2 TSF twice daily orally and syrup Livoment (f) (liver tonic) @ 1 TSF twice daily orally were also prescribed. Contract award notice: Supply of Iron Dextran (CosmoFerA). In the past, iron dextran given intravenously was associated with severe anaphylactic reactions, but now iron preparations like iron-sucrose complex and ferric carboxymaltose are available with excellent safety profile. Intramuscular iron dextran, another parenteral iron supplement is associated with the development of sarcomas at the injection sites in animal models21. Initially, iron dextran or iron sorbitol citrate were used. Table 1: Comparison of intravenous iron products available in Canada Iron Dextran Availability * Infufer[R] 50 mg/mL in 2 mL and 5 mL vials Available in Canada since 1997 Contraindications * Hypersensitivity or Precautions to product * Anemia unrelated to iron deficiency * Acute kidney infection * Concomitant use of oral iron products * History of asthma or significant allergies * Severe liver dysfunction * May exacerbate rheumatoid arthritis, or cardiovascular complications Adverse Events Serious 0. In fact, although anaphylaxis may have been associated with older intravenous (IV) iron preparations, clinical trials have demonstrated the safety of IV iron sucrose and low-molecular-weight iron dextran. The most widely used are iron dextran (INFeD), ferric gluconate (Ferrlecit), and iron sucrose (Venofer). A reduction of ESA doses has been observed in other studies using iron dextran therapy (Besarab, Kaiser, & Frinak, 1999; Besarab et al. A randomized trial of three Iron Dextran infusion methods for anaemia in EPO treated dialysis patients.